An Introduction to Mrs. Wishy-Washy—with FREE Download! I'd Like to Introduce You to Mrs. Wishy-Washy! I guess I’ve been living under a rock, because I did not know Mrs. Wishy-Washy until just recently. Now that we’ve met, we have become such good friends! We have both entered our (clean) animals in the fair and won! As a teenager, I showed cattle through 4-H and have a box full of ribbons to show for it! We are both farm girls. She currently lives on a farm and I grew up on a dairy farm. We are both hard workers. Her hard work, and cleaning obsession, is apparent in Mrs. Wishy-Washy on TV. She scrubs every animal and person in sight until they are sparkling! A cow, pig, and duck sang to me on my last birthday too, just like in Mrs. Wishy-Washy’s Birthday. Just kidding, but it was really sweet when it happened in Mrs. Wishy-Washy’s Birthday! Each book has a teacher’s guide specific to that book. It’s not a separate document that you’re bound to lose, but actually printed on the back cover. It’s a brilliant concept that I wish all books had! You could easily leave this book for a substitute teacher and just say, “follow the guide inside the back cover” and you’d know your students were going to get a great lesson. The word count for the four books I have averages out to 198—a perfect length for beginning readers. The stories are engaging and humorous. The vocabulary in the books is varied and each one has three to four specific words listed in the guide to pull out and talk more about. Students can take these new words and come up with antonyms and/or synonyms, put them in alphabetical order, or create new sentences using the words. The characters are constant. After reading a few books, children can expect to see the cow, pig, and duck. Stories can be created from one of the animals’ point of view. Predictions can be made about what the animals did to get so dirty, or what they’ll do after their baths. Book summaries are a great thing to do with your students to make sure they understand parts of the story. You can download a story summary chart below to use with any Mrs. Wishy-Washy book. These books would adapt themselves well to a Reader’s Theater script. After a shared reading of the book, students can work together to retell the story and create parts for a script as they work. All sorts of word studies can be done with these books. Mrs. Wishy-Washy’s Birthday lends itself to a study of onomatopoeia, words with suffixes, and compound words. Mrs. Wishy-Washy and the Big Wash has several rhyming patterns, and onomatopoeia. All of the books are great to use for punctuation lessons, because they have a wide range of sentence types and quotation marks. I have fallen in love with Mrs. Wishy-Washy and all the things you can do with these books. I’ve really just scratched the surface with the ideas shared here. There are two sets of these delightful books written by Joy Cowley. There is the Joy Cowley Collection, written for grades K-2 and then Joy Cowley Early Birds. The Early Birds Collection is written on a lower level. You can even enter to win books from the Mrs. Wishy-Washy series by entering the giveaway happening right now—just click this link! To download the Mrs. Wishy-Washy story summary chart, click the worksheet image below. 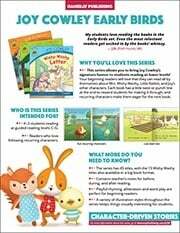 To learn more about Mrs. Wishy-Washy and see Joy Cowley's books, you can click here to visit our website, or click the series highlights images below to download an information sheet with key features.